The WordPress App for the iPhone has been around for a while now. 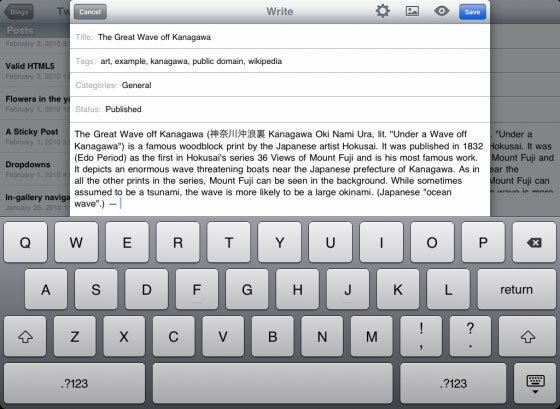 We hear today that WordPress for iPad has launched allowing wordpress bloggers to connect up to their blog from the iPad and edit/approve comments, create posts and create pages. There isn’t much difference between the new iPad version vs the older iPhone version other than the iPad version makes a lot more use of the large screen allowing for easier editing of posts and content along with being able to see a column down the left side of the screen showing comments, posts and other interesting information. This weekend will finally see the long awaited Apple iPad go on sale and sales estimates for 2010 are in the millions…7.1 million to be exact (according to iSuppli). This is expected to be followed by 14.4 million during 2011 and with 20.1 million sales expecting to be reached during 2012 – How I wish I was an Apple [AAPL] shareholder right now! 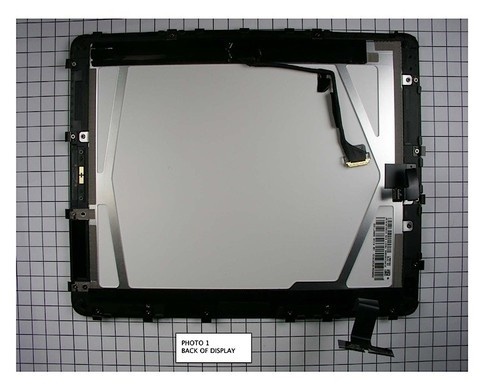 iFixit were quick off the mark and have analysed the FCC Apple iPad internal images in more depth than the average person it seems. The team have managed to extract the RAW files associated with the images which allowed them to essentially remove the blanks to reveal the real images behind including all the chip numbers associated with the chips. 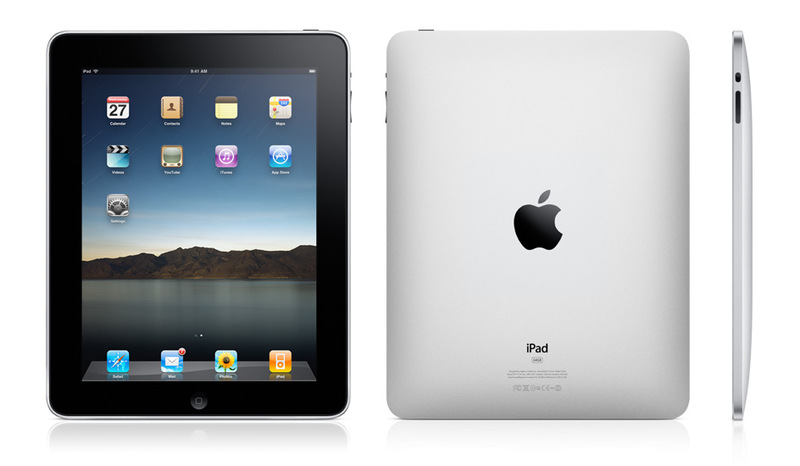 Have you been wondering what the Apple iPad looks like inside? The FCC have taken one apart to make sure it clears their tests and have posted the images on-line. One thing to note here is that this FCC teardown is no where near as in depth when compared to the one iFixit will do tomorrow, but it’s still interesting to see what’s going on in there including how much actual space there is available even though it contains a massive set of batteries. The picture above shows the back panel (the screen rests on top of this) whereby the two large brick shaped objects are the batteries that keep it powered for 10+ hours. You can also see the dock connector running across the batteries and see that it’s slightly unfastened from the bottom edge of the iPad. Google [GOOG] have announced that they have optimised their web services specifically for the Apple iPad [AAPL] that launches tomorrow. The update to services such as GMail have been optimised to work on large screen mobile devices to give a better email experience. 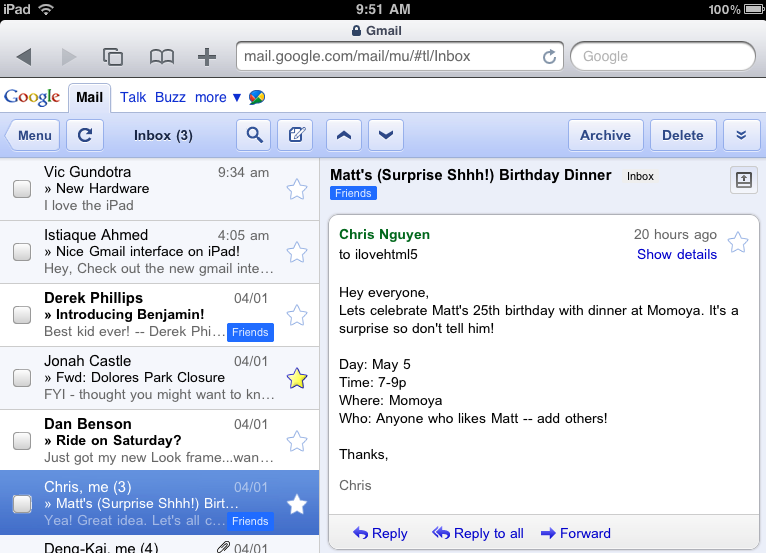 When visiting GMail from an iPhone for example, you just see a list of messages with buttons across the top to move around sections. The new iPad optimised version uses a two column approach where your messages can be scrolled through on the left of the screen and the message viewed on the right of the screen as pictured below. Flickr have announced that they have launched HTML5 video playback designed right now for those specifically who use the Apple iPad. The iPad, you’ll remember, doesn’t have flash video capabilities and from what we understand, it never will. Luckily for Apple [AAPL], unluckily for Adobe, it seems many of the major publishers are actually in the process of converting video over to the HTML5 standard that will allow the iPad to browse the news and photography sites without getting the small blue brick that indicates Flash is needed. You might remember iPhone socks that are basically protective socks that you put your iPhone in. The same concept has now arrived for the Apple iPad called iPad Socks that are basically giant sock that you can slide your iPad into to keep it free of scratches. 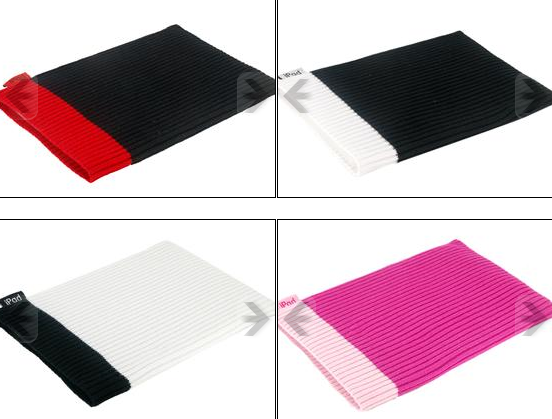 The iPad Socks are available in a number of colours (nine to be exact) and have an iPad label sewed on to the side. From the iPad Socks website…. Why would you buy an iPad Sock? Cause it’s the coolest most colorful protection for your iPad! The knit socks provide a stylish, fun, and practical way to protect your iPad. Get them now! MobileMe is an application available for Apple [AAPL] that allows various functions to be performed such as syncing email, calendars and other information across devices to make sure all stays in sync. 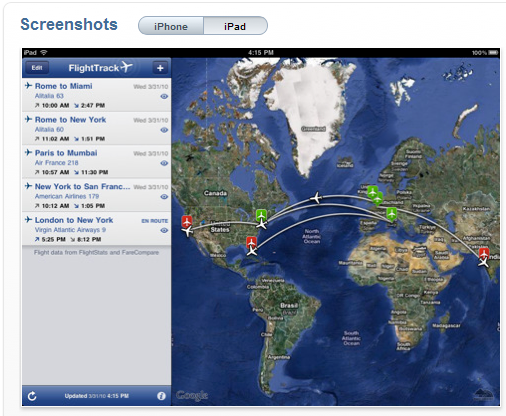 One of the features is called Find My iPhone which allows you to track the location of your iPhone when lost. The software remotely activates the GPS and transmits details to you so you can track it down. If you think you have no hope of finding your phone you can also perform a remote wipe ensuring that your data is not found by others. Find My iPad is now launching on the MobileMe service which allows you to do exactly the same as a lost iPhone… track it down or remote wipe it. BoingBoing were one of the lucky group to get hold of an Apple iPad before launch to give it a review. Along with that, another review was also done for the Marvel Comics App that is launching with the iPad. When launched tomorrow, the Marvel Comics app will have 500 titles available for download. Most of the titles cost in the region of $1.99 to download them. As well as a number of them costing to download, there will also be sections available for free. The applications also includes access to all the classic comics which includes Avengers, X-Men, Hulk, Spider Man, IronMan and other titles that you will be familiar with. 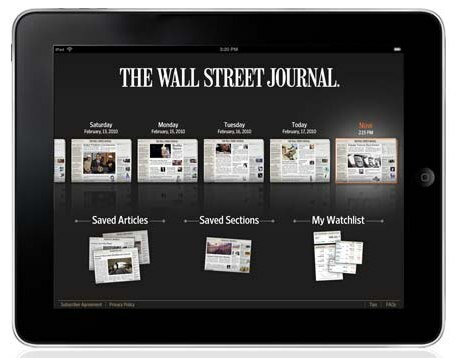 The price of a WSJ subscription on for the Apple iPad has now been revealed. The cost to get content on your Apple [AAPL] device will be $17.29/month which will include the ability to download a 7 day archive of news so you can take it along with you if you have no wireless connection available. The subscription cost works out at $3.99/week which with the extra 2 or 3 days added on brings it up another dollar or so to the $17.29 that will be charged to your card each month. In preparation for Saturday’s Apple iPad launch, Apple [AAPL] have now opened up iTunes to show applications for the iPad (link will open up iTunes). 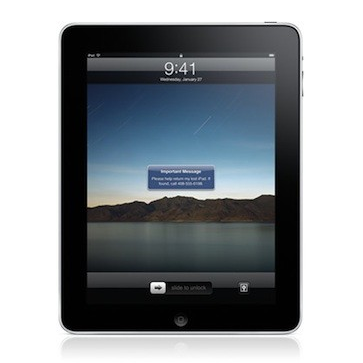 Once loaded up you’ll see a list of all the apps available for the Apple iPad that can be purchased now. When clicking on an application you then see the option of viewing screen shots for the iPhone version or iPad version as pictured below.